I don’t know Irish, so that Irish in parentheses in the title is possibly wrong. Anyway, this blog is many things, as you know. One of those things is not only to be a source of meditations upon the Great Tradition of Christianity — ancient, mediaeval, modern — but also to draw you to the sources — texts, art, practices — of the Great Tradition. To that end, I put together some bibliographies a while ago (basic, not-so-basic, on the Trinity, the Church Fathers online as well as ‘where to begin‘); there’s a chance I should tweak these, but every time I try, I don’t know what to add/remove! Irish, Scottish, and Anglo-Saxon saints live in a world that, to modern(ist/ised) eyes seems liminal in many ways. They wrestle with demons. They encounter Christ and the saints in dreams. They feel a oneness in God’s good creation. They make friends with birds. These men and women from the edge of the mediaeval world draw us in. Much ink has been spilled over the centuries praising the early saints of Ireland and Scotland, and in the past several decades there has arisen a movement of ‘Celtic’ spirituality amongst Protestant Christians that has both ‘liberal’ and ‘evangelical’/’charismatic’ strands. Some of the material from this Celtic spiritual movement is fairly accurate in its portrayal of Insular Christianity. Other material is not — although some of that other material may still be helpful to modern readers! Thinking about ‘Celtic’ — Insular — Christianity, I wish to strip away much of this modern romanticism. Yes, there is much good amongst these particular Christians. If they can enliven your spiritual life, set you on fire for Christ, and draw you nearer to him — good! But they are not perfect, and Christianity on the Continent was not hopelessly lost and warped, either. In order, therefore, to clarify the water, we need to come to grips with the actual writings and sources and art and liturgy of these communities. What were the actual spiritual practices of Christians in Ireland and the British Isles? What was their relationship with the Continent? What were their theological teachings? The best place to start is the writings themselves. So I put together a bibliography of primary sources. I’ve not read them all, but hopefully they will be helpful. If there are texts within my temporal bounds (up to 793) that I should include, let me know! 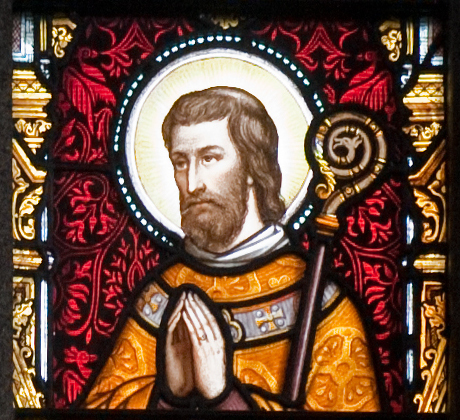 Yesterday was the feast day of St. Columba. He was born December 7, 521, at Garten, County Donegal, Ireland. He fell asleep in the faith of Christ on June 9, 597, on the isle of Iona, Scotland. a. Founding the monastery at Iona. b. Seeing the Loch Ness Monster. Coupled to his feast being this week is the fact that Iona is the picture on my calendar for the month of June, so I felt St. Columba was an appropriate choice. My main source is Bede’s Ecclesiastical History of the English People, Book 3, Chapter 4. Adamnan’s Life is undoubtedly fuller, but time is short, as I have a lot of reading to do. We learn from Bede that in Ireland, St. Columba founded a monastery “known in the Irish language as Dearmach, the Field of Oaks.” This would be modern Durrow. In the year 565, he crossed over to Alba (Scotland), where he brought the light of the Gospel to the Picts living north of the Grampians. Undoubtedly I had ancestors amongst these people, although most of my Pictish ancestors would have received the Gospel a century earlier from St. Ninian who preached to those living south of the Grampians. 565 was the ninth year of the reign of King Bride son of Meilochon. By his preaching and example, Columba established the faith of Christ among the Pictish people. They gave him the island of Iona on which he founded a monastery. He was abbot of the monastery there until his death in 597. 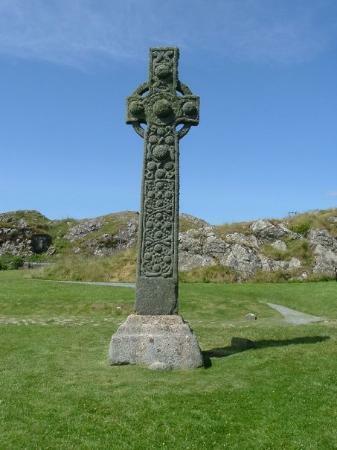 Iona became a great centre for Celtic monasticism as well as of pilgrimage. Kings of Scotland are buried there. The abbey is still there today, as the centre for The Iona Community as well as a place of spiritual pilgrimage for many. Two things to close, a poem and a prayer. First, that which, before things went kaput over at Matthew’s Random Ramblings, was the Weekly Poem on September 13th. This is a poem by St. Columba from Iona: The Earliest Poetry of a Celtic Monastery, reminds me of Anglo-Saxon poetry. As with other poetry you’ll find out there, its name comes from the first words. It is a Latin poem, although other poems in the collection are Gaelic. The translation is by Thomas Owen Clancy and Gilbert Markus. who live and reign . . .
O God, by the preaching of your blessed servant Columba you caused the light of the Gospel to shine in Scotland: Grant, we pray, that, having his life and labors in remembrance, we may show our thankfulness to you by following the example of his zeal and patience; through Jesus Christ our Lord, who lives and reigns with you and the Holy Spirit, one God, for ever and ever. Amen.